NB: The instructions below give the steps to setup Xero for use with Vinsight‘s WET Tax handling and assessment features. It will not enable you to accurately handle WET in Xero without Vinsight. Vinsight has great functionality that helps you handle WET Tax. This includes calculating any WET due on wholesale invoices, producing ATO compliant Tax Invoices, and at the end of of the tax period assessing all your Wine Equalisation Tax (WET) liability for entering on your Business Activity Statement. To learn more about WET handing in Vinsight read here. To learn how to configure Xero to work in conjunction with Vinsight to handle WET, continue reading. 1. Switch on the WET setting in the Financial Settings area. 2. Creating a holding account for accumulating your WET liability between BAS filings. 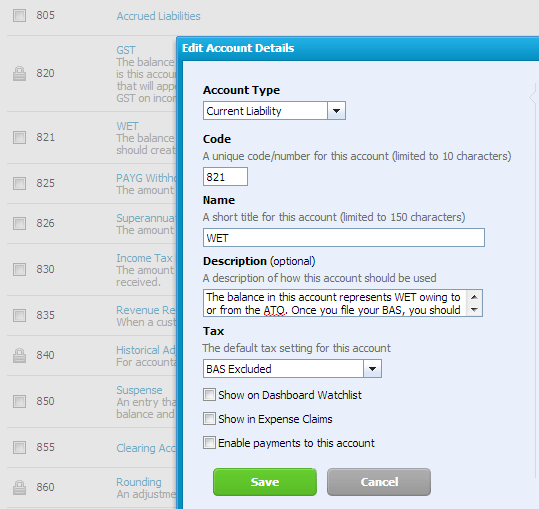 Description: The balance in this account represents WET owing to or from the ATO. 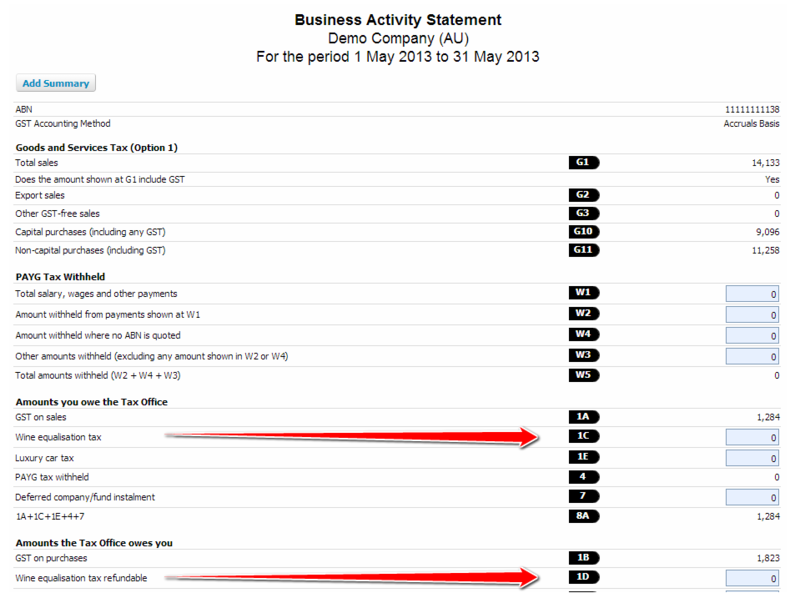 Once you file your BAS, you should create a AR or AP invoice to clear out the balance at the end of the period. 3. Understanding what you see when Vinsight posts WET data to Xero: Vinsight contains all the correct WET details and ATO compliant tax invoices, and post balances of those to Xero which allow you to combine this info into your BAS statement. 1. 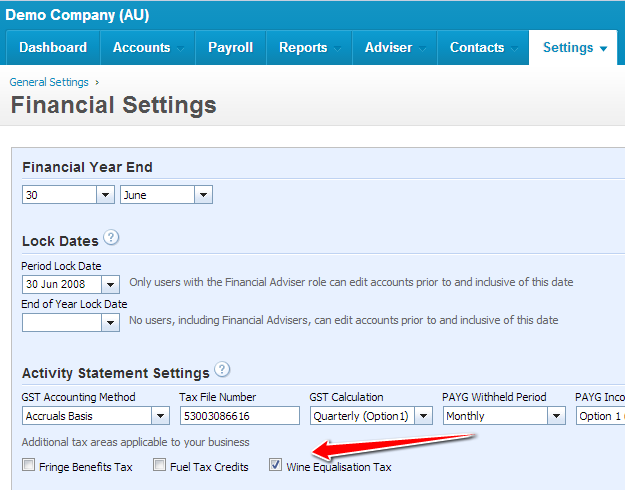 Under Settings, Financial Settings, check the Wine Equalisation Tax tick box. We suggest having BAS Excluded set as the default Tax Setting because Vinsight will automatically post the correct GST handling for the WET amounts. This leaves the only manual use of the WET account being people journalling or adding liabilities to the ATO which will be GST exclusive. 3. When you raise a Wholesale invoice in Vinsight and post it to Xero. Vinsight will caluclate the correct WET liability, and give you a nice invoice that shows the WET and meets the ATO requirements. In Xero we will post this to a Sales Invoice with a separate line item for the WET from liable items and exclude values from those that are not liable. So Vinsight becomes the master record for your WET calculations and WET compliant Invoices, yet the balances are kept up to date in Xero. When you raise a Retail, Own Use or similar invoice in Vinsight, the invoices are posted without WET Tax, because the WET amounts are calculated and posted on the WET Assessment in Vinsight at the end of the tax period, and the balances posted to Xero then. There is a mantra in the software world to help you avoid redoing work: Don’t Repeat Yourself otherwise know as keeping DRY….so the corny line here is Keeping DRY when you are doing your WET.